MORAIOLO: obtained exclusively from the best Moraiolo olives from Umbria, carefully selected by Tiziano Scacaroni. This medium-fruity olive oil is complex and powerful in flavor with notes of artichoke, mint and sage. It’s a wonderfully pungent oil with a sweet almond finish. Pair this oil with grilled red meats and vegetables, or drizzle over bean soups and bitter greens, such as arugula or endive. FRANTOIO: obtained exclusively from the best Frantoio variety olives from Umbria, carefully selected by Tiziano Scacaroni. This medium-intense oil has strong notes of artichoke, arugula, tomato and herbs. Makes an excellent dipping oil for fresh bread or drizzled over bean soups, grilled vegetables and meats. LECCINO: obtained exclusively from the best Leccino variety olives from Umbria, carefully selected by Tiziano Scacaroni. Leccino’s flavor is characterized by aromas of aromatic herbs, almond and subtle nuances of bitter greens making it ideal for ceasar salads, fish, white meats and risotto. 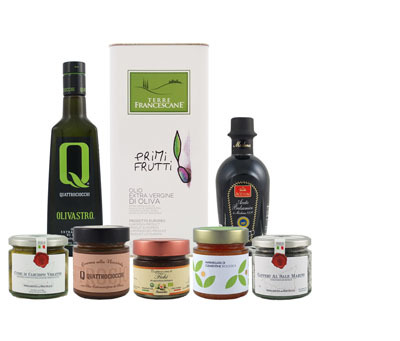 ORGANIC: obtained from a selection of the best organically grown olives from Umbria, carefully selected by Tiziano Scacaroni and certified by the Instituto Mediterraneo di Certificazione. The oil is emerald green and pleasantly pungent with a strong aroma of mature olives and a slightly almond aftertaste, ideally suited to dress vegetables, bruschetta, soups and meats.